No I am not talking about the late 90’s Britney Spears hit (although a specific image springs to mind). I am talking about the six boxes of wine I can see on the door step as I turn into my driveway, the big smile growing on my face which is instantly replaced with a wince due to the ear piercing shrill from my wife “SSTTTTUUUUUAAAAARRRTTTT”. Don’t laugh! I swear if she had a rolling pin in hand I would have been pummeled. In my house there is always an element of danger involved when buying wine which results in my mixed feeling of nervous expectation when I see the wine boxes stacked by the front door. I feel “PURE FEAR” like a naughty school boy sent to the headmaster’s office because I know my wife will kick my arse when she finds out how much I spent. I always try to cover by saying ‘I got some champagne for you too and they are the most expensive purchase’ in a weak attempt to redeem myself. But the possible risk of physical injury passes as “JOYFUL EXCITEMENT” takes hold as I take the boxes inside, unpack and inspect the bottles. I check the wine to make sure they delivered the right bottles, check for signs of damage or signs of leakage and start cataloging the wine (yeh right). Carefully selecting what I will open that night and what will be put away to allow the sediment to settle. As I buy wine I can hear the devil’s advocate in my head saying, “go on, you deserve it, you work hard… get a couple of bottles of champagne to sweeten her up, just in case you get caught… she probably won’t even be at home when the delivery arrives”. My latest purchase is the beginning of my real wine cellar and time to experiment. We have finally bought the ‘family home’ and I have a space that holds a constant temperature. My mates say “it looks more like a shop” which makes me laugh and in a way they are right. I am concentrating on a creating a wide selection of wine varieties from Muscat to Port, Riesling to Durif and international blends. I have always bought wine for all occasions and I like unusual varieties. If I find a wine from a local shop or supermarket I will seek older vintages of the same (or similar) wine to gain an understanding of how it will evolve. I love Pinot Noir, which is a curse as it can be expensive and recently drank a 2011 Coldstream Hills Pinot Noir which was very reasonably priced. So when I saw the 1990 at auction I bought it. I expect it is past its peak, but the window of opportunity for good drinking is still open. I will now keep my eyes open for late 1990’s and early 2000 vintages and when I have a small selection I will invite the rest of “The Wine Wankers” around to compare and discuss vintages… which will of course evolve into talking complete rubbish as we get very pleasantly drunk. Next Sunday Night Tasting – When is the right time to open a Pinot Noir? Stu, come on, everyone knows Britney released that beautiful song in March 2000, don’t they? hahahaha yeah it was in 2000 🙂 I loved reading your post though! I get blamed even when the missus is the one doing the ordering. You’ll never win so might as well carry on regardless i reckon! Charming story. Thank you for checking out my page. Prost! I used to love drinking wines from the 80s and 90s’ back then too. Fruity Lexia was really trendy and you were loved by the ladies if you got them drunk on a cask of that one. Ha LUL. I was always a bit of a Claret wines man myself. Good wines times back then hey. Phew! You escaped her wrath with humour. Would probably open at least one bubbly just in case! 🙂 Thanks for adding “Honey” to your follow list. Must think of a wine post now. Wow six cases!!! Fabulously written I look forward to reading more!!! I can totally relate to this! 😉 Cheers! I can’t really drink alcohol – just don’t care for it, but I do appreciate very good wine so I will follow this with interest to get tips on what to serve guests, bring as gifts, and take a sip of now and then. Conrad is the man for those kind of tips! Anyone who knows me knows that I am far from a wine expert although I do enjoy a bottle a day. I started following this blog because it made me laugh and it inspires me to learn more about wine since I enjoy it so much. This is one of my favorite recent posts. Oh yes… happiness all the way! 😀 And great minds think alike. Such wine we have today! There was a time when a bottle of Yugoslav Reisling on the table was seen as sophisticated. Hehehehe I’m gonna like this blog! I am glad it made you smile. Hi, Stuart, thanks for liking my blog. I read about your wife – good girl! Hope you like the rest of our posts too! I think my husband has around 900 bottles, but that is better than his friend Gordon who has 3000, and their mutual friend who has close to 5000! That’s awesome! If they need help drinking them, the wine wanker team are more than willing :). We hope you enjoy our blog. Thanks for the like on my blog… So enjoyed this post, as I have a hubbie who has been known to do the very same thing!!! Over & over, I might add 😉 I don’t mind tho, as I love wine as much as he does!! Keep up the good work… it’s tough work, I know!! Cheers! In my case, although I’m French (from Cote Chalonnaise, Bourgogne) and my wife is Japanese, my worse half guzzles wine every night, so no problem if I buy too much wine! The aggro starts when I bring too much Japanese sake for own consumption! Sturat, thanks for visiting my blog at http://shizuokatoursim.com/ but you might even be more interested in http://shizuokagourmet.com/ ! We have loads of Aussies here in Shizuoka. They (we) guzzle all the time and we even play cricket! Serious! Looking forward to reading you soon, mate! Actually I would be most interested to know about this sake brewery! If you want to know moare about sake tasting check this: http://shizuokasake.me/! Going to visit right away! Coming back soon with comments! Thank you for stopping by my blog and liked my recent post of “Catch Me if You Can” image. I wonder what kind of rice they use. Probably imported although sakamai/sake rice (not to be confused with normal rice which is not used to make sake) could be grown maybe in Tasmania.. Pity they do not state the rice millage percentage. The daiginjyo is also definitely too low in alcohol. As for the Tsunami cocktail I will refrain from making any comments….. I just found out it is partly owned by a Japanese company…. Very good business sense I must admit! I surely understand “joyful excitement”, too! Thanks so much for joining mine!! I hope you’ll enjoy having fun with me . . . . . . . . . . ..
Hi, thanks for visiting my site and liking my post! Well now, you’re speaking my language – champagne certainly works for me and I love wine too! Merci, too, for visiting my blog. Sante – tchin tchin – a la votre! This blog makes me want to move to Australia, just so I could try to meet you all. What a great attitude toward life. Really. A toast to all of the Wine Wankers! Cheers!!! Glad to know there are people like us! I recently found some chocolate wine at the pharmacy and it’s so good! I guess I’ll have to find some online to buy for Christmas. I have had some of that… its good! 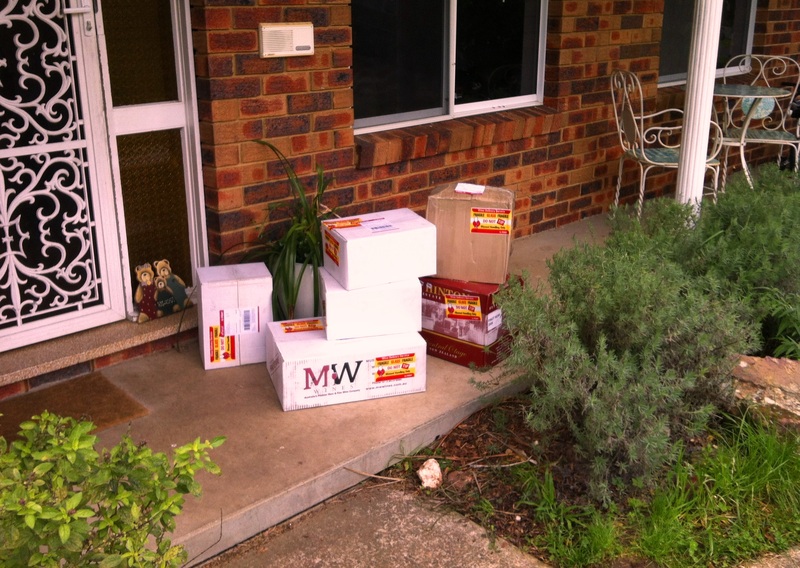 The first picture of the wine staked up outside the front of your house made be openly giggle. Our friend has the same compulsion to purchase large quantities of wine in the exact same way. They have converted their garage for the purpose of storage for their wine collection (and any other booze they wish to add to it). Whenever we go over we have a series of different wines to taste – over the years there have been some great, some good and some bloody awful but we still keep returning to find out what he has added to his collection. I don’t know much about wine and I’m not overly fond of it, but I love your blog! So, I’ll retain some this great info and you never know, it may serve me well. A little knowledge can be a dangerous thing! You are quite daring! I suggest a trip to Tokyo to even things up! This makes me feel so much better about “only” buying 6 bottles of the good stuff today. It was 30% off, and then another 10%? How could I not! 🙂 Cheers. Mate you should have got at least a dozen!!!! Ha! I could have used all those bottles to get me through the inevitable divorce that would follow. 🙂 Cheers. I’m sure she knows it’s a trick. And enjoys your cheekiness. I thought I’d finish off the year with a reblog of a classic post written by Stu. We’re all flat-chat with our non-blogging lives at the moment, with Christmas, New Year and all, but will be back early in the next year with lots of new wine stories to tell and a new face to introduce as well, which we are very much looking forward to. So I hope you enjoy this post from August. In my mind there were days “before Oops” and days “after Oops”. This post coincided with a big uplift in readership. Have a great New Year everyone! Blimey! It’s going to be a long New Year Down Under! Do our wives know each other?!? The forgiveness stops when the champagne runs out, so its always good to be well stocked. A true wine wanker always has bubbles in plentiful supply! My husband would definitely have something to say to me if he arrived home to find cases of wine at the front door, but I would remind him that his boating habits are expensive and then open a bottle. 🙂 Happy New Year and congrats on the new home! I am such a sucker for the weekly “deals” from our local wine shop. 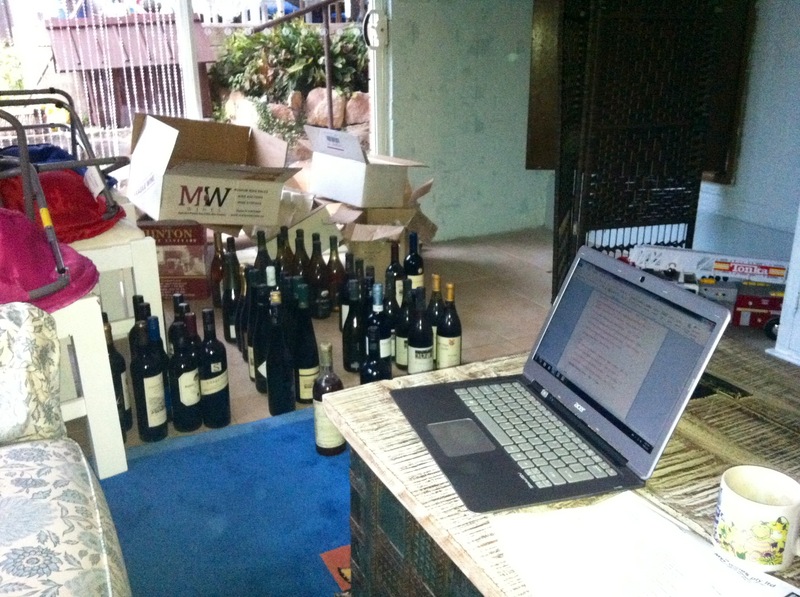 a half case here, a half case there…luckily my wife trusts my judgment and agrees it’s a great way to try new wines. great idea to look for older vintages of stuff you like! I wouldn’t have thought of that! Your a lucky man to have your wife on side! This really cracked me up! I’m constantly ordering things and praying the delivery guy comes while my husband is at work. I love your blog! This really made me laugh.. 😀 But, indeed there’s a joyful excitement especially when it comes to unpacking TONS of good wines. Regards!